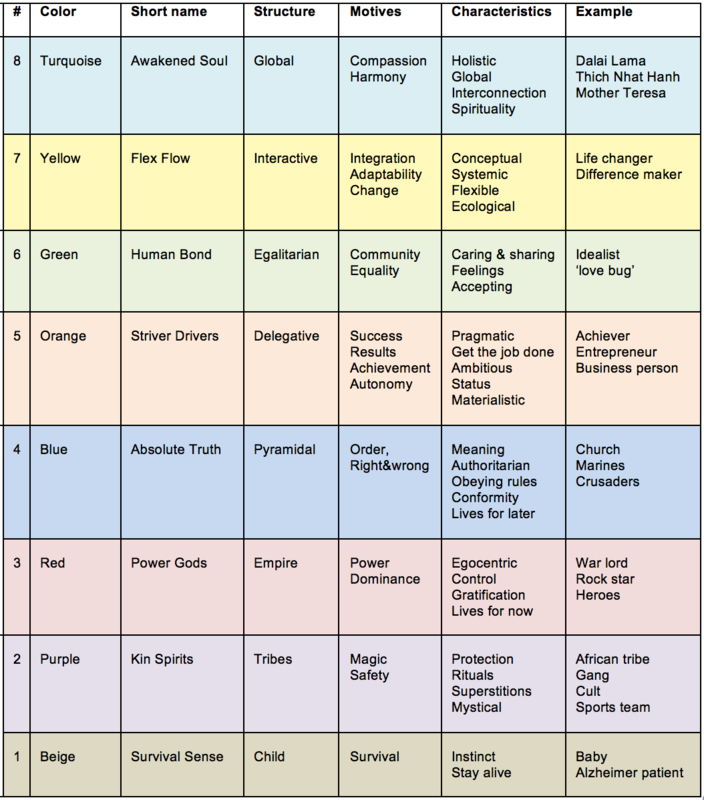 The ‘levels of consciousness’ concept (LOC concept) describes a model of human consciousness through stages of spiritual development throughout our lives. 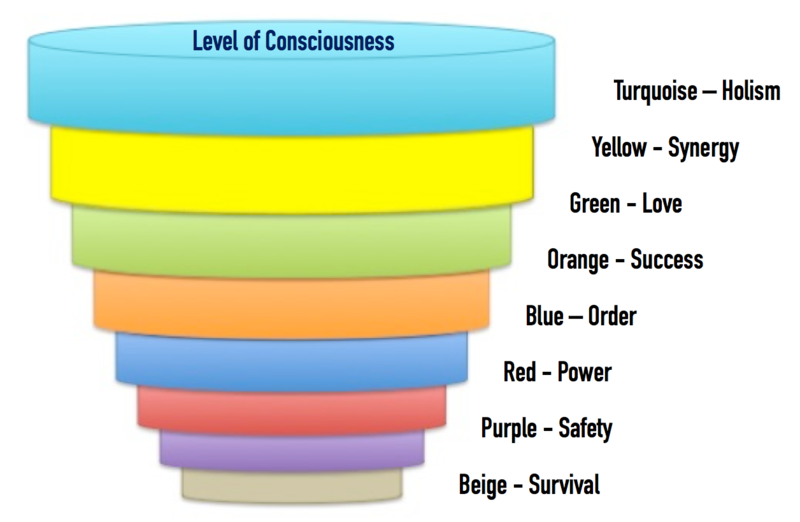 The 8 levels of consciousness were developed in 1970 by psychologist Dr. Clare W. Graves (1914-1986). Consciousness is about who and what you care about. During our lives, we evolve through eight stages when it comes to our consciousness, according to the concept of Graves. And as we evolve through each of these stages, all previous levels of consciousness are still active and effective, so we are able to keep using all stages in a dynamic way. All stages have a color. We all start in beige – as a baby. And once we grow and develop, we face new challenges in life. As a result, we have to change and reach higher stages of consciousness to deal with these challenges. Because, imagine what life would look like if we’d still have the consciousness of a baby right now. No person can be defined by a level! That’s very important, and it means that what people think and do is not who they are. People are not egocentric; instead, they do egocentric things and have their center of gravity at a certain level in certain situations and settings. No one level is more important than another! And no one level is more beautiful or ugly than another. They all have its role in the Bigger Picture. And in a certain moment in time, everybody has his center of gravity at a certain level. The ‘laws’ of the concept are that you can always move up in the stages. And you can also always move down to access the process of that level. But you cannot skip a level when developing our spirit and consciousness. The first level is the ‘Beige’ level of existence and certainty. At this level, life equals survival. It’s the level of newborn babies. And the focus is on: I want to live. This level is concerned with instinctual drives of survival of the species and immediate gratification of the very basic needs of food, water, and safety. Therefore, this level is sensory-driven. A ‘Beige’ oriented newborn will automatically move up to the next level. As we grow older as a child, we enter the ‘purple’ stage. On this level, the world is mysterious and frightening. This level is highly motivated by certainty, and it’s fear based. That’s why young children can be so shy. But also centuries ago, when we thought the world was flat, we banded together in a tribe to appease the gods or spirits. To keep them happy and the ‘tribe’ safe, we used ceremonies, rituals, and ‘magic’. At this level, life equals sacrifice. The focus is on: we want to live. Now we can stay at this level in a disempowering or empowering way. Superstitious riders who want to avoid ‘bad luck’, might do a certain set of ‘purple’ rituals before they enter for example a competition. So they might wear special socks, or do things in a particular order. This way they feel calm and secure because they have performed the ritual. Riders who are afraid of their horse, or afraid of riding, who have a sort of calming ritual (breathing exercises, a walk in nature, meditation) before they work with their horses. Riders who prepare things well with a set of routines, to set their training up for success and to keep things safe (helmet, body protector, mounting block, quiet surroundings). Riders who are afraid of their horse or suffer because of their horse, might step into the role of victim or martyr, which can be an expression of a ‘purple’ level of consciousness. This is also the level of riders who step into the role of ‘medicine (wo)man’ to treat their horse with any kind of herbs, vitamins, treatments, rituals and medicines, even when the horse is not sick. Instructors that operate on this level might be significant driven and become ‘keepers of mysteries’ or ‘gurus’ to attract their students. They are very good at storytelling, or in building smoke screens by using difficult words and long complex explanations. They also use slow-motion videos to mystify things. Instructors who lead ‘purple’ groups often have a foothold in the next – ‘red’ – level, which is also called the level of the ‘Power Gods’. That’s the age when they start to say “No” to everything. The core motivation at this level is about doing what you want and being who you are, regardless of the consequences. So the red level of consciousness is egocentric, impulsive, dominant, and control-driven. The focus is on: I want to be in charge. At this level, life is battle. It’s about power and beating the competition. So for the three years old, this can lead to competition with his mother and siblings. But some people stay on this level forever and become head of a gang or the mafia. Therefore, it’s also called the level of the Power Gods. Where older people run for success at all costs. At this level of consciousness, the needs of the individual outweigh the needs of the group. And those who criticize deserve to be punished. Riders who value themselves highly will use boundaries, rules, and limitations, to keep things safe for themselves. And they will set those clear “don’t-mess-with-me” boundaries both with horses and humans. An instructor who starts to teach in telling style in order to ‘squeeze a student like a lemon’, because he sense the student is on the border of a break-through, he knows it’s in there, and he wants to get it out. Instructors at this level can be real ‘drill sergeants’. They treat their students as soldiers. Riders with a higher level of consciousness who turn angry might go down to this level to get what they want. They often start using escalating (physical, energetic and verbal) pressure with both horses and humans to dominate the situation. Riders who apply the ‘telling’ style in a very ‘bossy’ way and ‘make’ their horse do what they want. Riders who use force to get ‘quick fixes’. You also see Power Gods (both women and men) on the Internet, also called Internet Trolls – burning other people down, calling names, expressing their anger and frustration in an impulsive way. You can’t start a balanced discussion with them, because they only want to hear what they want to hear, they don’t want to lose, and they are unwilling to submit, and it’s all about being seen and heard and feeling significant. 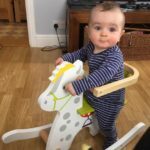 When we – as a 3-year-old – get older and realize that this bossy style of acting takes its toll, we might shift into the next wave of development and turn ‘blue’ to live in an orderly system. So we will go to school or college. And this fits the blue level because it’s the level of an authority structure that enforces a rulebook and absolute principles. At this level, there is only one right way: the school’s way. You have to follow a lesson schedule. You have to be on time. You have to learn things that are predetermined and imposed from the outside. You have to do and pass tests. Authority is highly respected by most of the students, so that they will listen to their teachers. So on the blue level, there is obedience to rightful authority. Good work will be rewarded, and ‘evil’ will be punished. So if you break the rules, and don’t behave, you have to bear the consequences. This means the focus is on creating meaning, discipline, morality, and rules. Plus, the focus is on the task, not the person. And at this level, life is test. So we can be at this stage for a while, but some people stay here forever. Because at this level people find purpose in their life. So they join for example the Marines or the Navy SEALs. Or they join a religion. A ‘blue; organization values order, rules, and regulations. And the people at this level have a desire to do ‘right’ and to do ‘good’. They are likely to dedicate themselves completely, more or less extreme. We can access the process of this level in a disempowering and empowering way. Beginner riders who start a new method and follow this method in a strict ‘blue’ way. By doing so, they dedicate themselves to chase one rabbit because they know that when chasing more at the same time, they’ll end up with nothing. Advanced riders know when to turn to ‘blue’ to avoid losing sight of the essence. They know that practice must be based on sound ‘blue’ principles. Otherwise, it might look good on the short run (look-alike), but it won’t last on the long run. An instructor who is going to teach a beginner rider will keep his instructions very ‘blue’ to not confuse or overwhelm a newbie with all possible exceptions to the rules. Fanatics who follow a method very strictly, and believe that there’s only one right way, and that’s their way. Following the rules gives them a superior feeling and feeling of significance. So they follow the rules strictly, and see the world in black/white, right/wrong, good/bad. Breaking the rules means that ‘you are a bad person, you are evil’. You’ll find fundamentalistic riders in the areas of a ‘one-tool-only’ approach, such as in equestrian disciplines where they only use positive reinforcement (clicker/target training), or only negative reinforcement (natural horsemanship). And you’ll find them amongst riders who ride bitless, riders who are pro-helmet, riders who base their work on the ‘truth’ (science and biomechanics), and also amongst natural hoof trimmers, animal behaviorist, and other specialists. On the internet these ‘blue’ thinking people often start to condemn other methods/concepts /tools (for example the use of pressure or the use of bits or whips) in an attempt to make themselves seem more empathetic and kind to horses. Instructors on this level will also say “There is only one right way, and that’s my way”. act on this level. Because this level meets their need for certainty and significance. They feel safe in knowing that they know, and often use difficult scientific jargon and long technical explanations to make them look special and important. Be aware that some instructors can be very ‘yellow’ themselves, but their loyal followers might be very ‘blue’ in applying and ‘preaching’ this instructor’s method. When an ambitious young adult graduates from school, he might want to achieve something in life, so he enters the world of business and entrepreneurs. With this, he might enter the ‘orange’ level of consciousness, where authority is not highly respected, and the people are competitive and task and result oriented. Also, adults might feel the need to move up: when the blue rules are too strict and limiting to a rider, or the rider becomes tired of the rules, or the rules cause too much pain, the need to move up to orange may arise, because in orange there are no rules from others. At this level, life is game, and people are highly self-motivated to reach their individual goals and to reach status, success, and recognition. The focus is on being pragmatic, taking risks, and doing whatever it takes to get ahead and to get the job done. 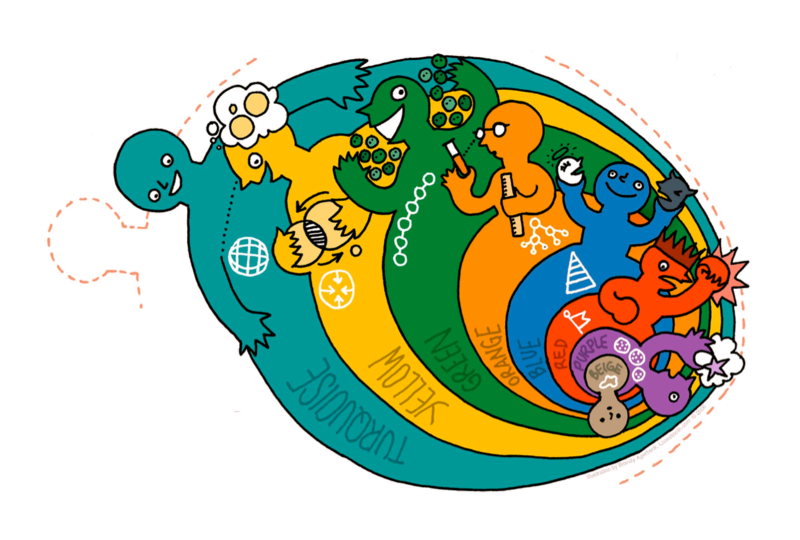 Orange level thinking rationalizes the means to reach the ends, and learning takes place through self-experimentation and observing what has worked for others. Therefore, people on this level are capable of seeing many ways to solve a problem. Now our center of gravity can be at this level in a disempowering and empowering way. Balanced orange thinking riders are not in competition with anybody else, but with themselves: they want to become a better version of themselves. So they train to improve, not to prove. They work for a cause, not for applause. They train to express, not to impress. Riders who are willing to step out of the comfort zone, and to think outside the box, are orange thinking riders; They are happy to enter the stretch zone because that’s the place where growth takes place. Riders who investigate and innovate in their ‘laboratories’ and know there’s not a ‘one-approach-fits-all’. They have the flexibility of choosing the appropriate tool out of their toolbox to get the results they are looking for. Riders who are highly motivated to reach their personal goals and who value ambition, competition, success, and significance highly, might value them above the needs of their horse. So they rationalize the means to reach the ends. 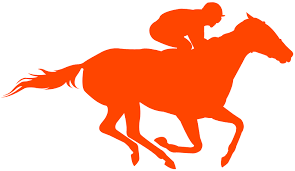 Orange riders and their coaches might start to use the horse for the dressage, instead of the dressage for the horse. If the horse doesn’t fit or doesn’t develop quickly enough, they buy another one that’s more promising and successful. Fanatic orange oriented riders who fail to succeed, might get angry and drop down to the red level of Power God. When orange oriented people burn themselves out in their material world, they might think “Is this all there is?”. When there’s dissatisfaction in orange, because the status, success and stars and stripes do not lead to happiness and fulfillment. When people experience too much pain from competition. So this leads to a transition into the ‘green’ level of consciousness where inner peace and unity are valued over materialism. In green, people can return from a human ‘doing’ to a human ‘being’, and they will be loved no matter what. They freed themselves from the orange ‘direct line’ and now live more in ‘circles’, doing a lot of self-examination and introspection, ending up with little production. At this level, life is about connection and love. And feelings become more important than rational thought and materialism. It’s about acceptance, harmony, peace, happiness, equality, and believing that all humans are loving, good, and can learn to appreciate one another. The ‘green’ culture focuses on building a tolerant community that is accepting of differences and diversity. A green-thinking rider is driven by love and connection, so he wants to connect strongly and deeply with his horse. He’s very caring and concerned about the horse’s mental, emotional and spiritual well-being, but he doesn’t forget to take care of the physical balance and athletic development of the body. A balanced green rider remembers his orange roots, to avoid going too much in circles. So he keeps an end goal in mind, whilst knowing that it’s about who you become and not about what you get at the end of the journey. A green-oriented instructor is also driven by love and connection, so he will deeply care about the student’s inner world. But he avoids to end up with lessons where they only talked about the feelings of the student. So he keeps the end goal in mind and doesn’t get sidetracked by the ‘stories’ that a rider is making up why he cannot have things. Some green-oriented riders only want to ‘be’ with their horse. They want to ‘live and let live’ and avoid anything that might upset them or their horse. So they never leave their comfort zone and never set a new goal. As a result, they stop learning, growing and evolving. 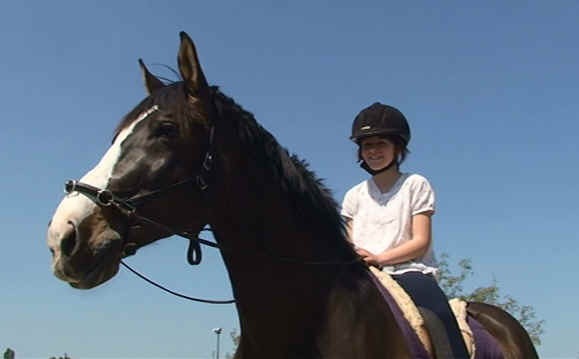 Riders who mainly focus on the mental, emotional and spiritual well-being of the horse, might forget the physical side. 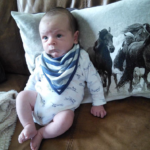 Therefore, they might start to ride their horse in ‘hammock style’, being a passenger only, and this might ruin the horse’s front feet and back due to his unaddressed natural asymmetry. Riders who see hierarchy as a problem. They want equality with their horse, but not all horses are comfortable in this situation, because of lack of clear boundaries. Instructors at this level who have skipped the orange level might present themselves as an ‘Earth mother/father’ or ‘Protector of the weak’ – believing that when you have a big enough and open heart you can give all that the horse and his owner needs. With this instructor, much time and energy are spent processing the range of feelings of riders and horse. But this might be a weak version of a true ‘green’ instructor when he’s not able to help the horse on a physical level in a more holistic way. Some ‘green’ oriented instructors might also be ‘reds in disguise’; they can frame themselves as ‘green’ to make themselves look good, to be more significant, and to have more power. When they realize that just ‘being’ doesn’t get you anywhere. When expecting that all humans are equally good and loving creates more problems than it solves. When ‘green’ oriented people are getting bored with the ‘being’ and the ‘circles’ and feel a sort of ’empty’ because they don’t feel they can make a positive difference for the ones around them. When they feel the need to contribute more. A person at the yellow level of consciousness listens to others, regardless of their level, but they value contribution above love and connection. People at the yellow level of consciousness want to contribute to the world and they want to produce something that lasts. They want to express themselves and experience self-actualization, but never at the expense of others. To be able to contribute to the world around them, they fly like an eagle and see the Bigger Picture. At this level, life equals system. They are able to see from a helicopter view and perspective that is larger than level 1-6 combined. A ‘yellow’ oriented person knows that there is a time and place for everything; for Beige, Purple, Red, Blue, Orange, and Green. 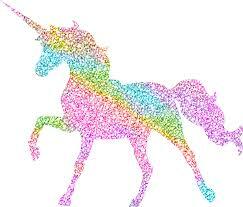 As a result, boundaries of ‘black’ and ‘white’ dissolve into ‘grays’ and all the other colors of the rainbow. Yellow thinking people have a broader understanding by seeing the value of all levels and all concepts. From an understanding of the need for adaptive, flexible approaches, people on this level will integrate all concepts to address issues and problems. Our center of gravity can be at this level in a disempowering and empowering way. They use ‘beige‘ for survival and to stay alive. They use ‘purple‘ for safety and security. They set clear and healthy boundaries in ‘red’. They turn to ‘blue’ to study science and all possible concepts and principles, to have all the tools in their toolbox. They set reasonable goals and strive to become the best they can be in ‘orange’. They enjoy and love the process in ‘green’, and put the needs of the horse and the relationship first. 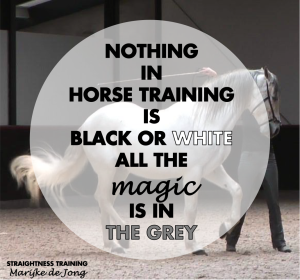 And they combine ‘black’ and ‘white’ and the science and art of horse training in ‘yellow’. Yellow oriented riders use whatever is needed to serve the horse and situation best. By seeing the Bigger Picture and the value of all concepts, tools, approaches, strategies, techniques, a rider on this level can tap into their intuition and can act and think authentic, to come up with the best tailor-made approach for any kind of horse in any kind of situation. Yellow thinking instructors want to make an impact on a large scale and leave the world a better place. Riders and instructors at this level might express a level of arrogance about their broader perspectives and understandings. When the interconnecting technology creates chaos and new global problems. When s/he’s about to leave life. However, not many people reach this center of gravity at the Turquoise level at the end of their lives. At the turquoise level, an individual is seen as a part of the larger cosmos, a conscious collective, which serves the whole and the one as the same because they are not separate. 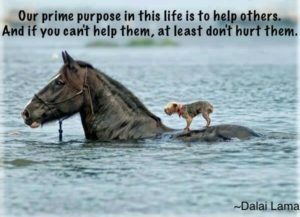 This is the level of the awakened soul and spiritual leaders such as the Dalai Lama, Mother Theresa, and Nelson Mandela. Turquoise is a global thinking level which takes an interconnected view of living, working and the environment. At this level, life is about unity. They know that even the unknown is part of the whole. Turquoise thinking people are aware that all actions and non-actions impact all beings, all planets, the entire cosmos. In the Turquoise level, order is understood within the chaos of the universe. Paradox is embraced and known as essential. People at this level see the earth and all living beings as ‘one’ and understand that sacrifices are necessary by all for life to continue. Turquoise people learn intuitively and experientially. They value experience, and through experience, they communicate with all there is. They have a broad awareness, are deeply grounded, and live minimalistically to create more for all. Now at the end of our life, our center of gravity can be at this level. But we can already access this level at certain moments. So we can be on this level in a disempowering and empowering way. Some turquoise riders might get an attitude of “been there, done that” and lose their Beginner’s Mind. Some turquoise instructors might be a ‘blue’ or ‘orange’ in disguise; they can frame themselves as ‘ultra-spiritual’ to make themselves look ‘turquoise’. However, because of the orange influence, they might be competitive because they want to compare how spiritual other riders and instructors are to themselves. Because of the ‘blue’ influence, they might judge other people who are less spiritual than them to make themselves look like a better person. Riders or instructors with such a broad awareness may experiencing difficulty with creating direct and focused action. Not many riders will live here permanently, but some have access to be in a turquoise state in certain moments. In those moments they will be experiencing non-duality, where there is no good or bad, right or wrong, and realize that everything that occurs is perfect as it is because ‘it is’. 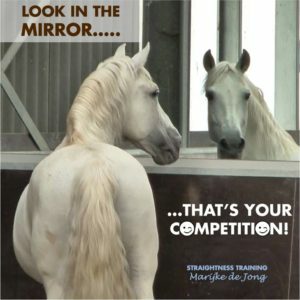 When it comes to horse training, we can combine it with the level of consciousness. Whatever you prefer how to call it, it doesn’t matter, the map isn’t the territory anyway! Where Do People Go Under Pressure? A ’blue’ thinking rider can turn ‘red’ if you are violating his rules. He can openly attack you with words when you are not wearing a helmet – because his rule is that you need to wear one; or when you use pressure/release – because he lives in the house of positive reinforcement; or when you give treats – because his rule is that horses in the wild don’t give each other treats, so we shouldn’t do either. Riders who base their work on the ‘absolute ‘blue’ scientific truth’ might turn ‘purple‘ when the ‘real world’ doesn’t fit the ‘map’ of the territory (because the ‘art’ of training’ – with all the magic in the grey – doesn’t always follow the black/white ‘science of training’). In ‘purple‘ they build safe smoke screens to mystify things by using difficult words and long, complex explanations. A ‘Green’ thinking rider can turn ‘blue’ when you are violating his rules (no bit/whip/pressure), and they can even turn ‘red’ when they see you ‘correcting’ your horse with a backup. The ‘green’ might act ‘passive aggressive’ in ‘red’ – just giving you a feeling that you are abusing your horse – or turn ‘Red’ by openly attacking you by calling you names. Some ‘greens’ are very caring for horses, but they are very good at judging (‘blue’) and punishing (‘red’) other people. A rider with an ‘Orange’ level of consciousness who gets stuck and doesn’t get the results he wants, can turn ‘red‘ and become bossy and angry towards his horse and/or other people. An ‘Orange’ thinking rider can turn ‘purple‘ when fear takes over, because when he consciously thinks he’s not good enough, his unconscious might believe that in that case he won’t be loved and that will mean that you will be disconnected from everybody. Where to go in a conflict? If you have an issue with another rider, you can never fix this issue by going to the same level where the other person is. You can also not fix it by going to a lower level than the other person. So when somebody is in ‘blue‘, and is following his own belief and rule (“Whips are bad“), and you are going to stick to your own ‘blue’ principle (“One cannot train a horse without a whip”) that won’t help to solve the conflict. Or when somebody is in ‘blue‘ following his own belief and rule (“Helmets are only for those who don’t trust their horse”) and you turn ‘red’ and you force them to wear a helmet, you will not get anywhere. Better to go up a level to solve any kind of problem. 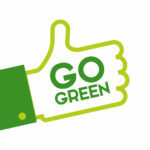 And even better: go ‘green’! Because the level of ‘green’ is about love and connection, so that’s a perfect place to be to be solving problems and eliminating frustration. This concept about the levels of consciousness is a ‘map of the territory’, and it’s used to create awareness and understanding. People are not ‘red’, they have ‘red’ states. People are not ‘blue’, they can react ‘blue’ when they feel they need to protect ‘their rules’. And all stages are necessary for spiritual development. Plus, all levels have advantages and all create problems. So, no level is better than the others! And multiple levels operate within us at different times and under different circumstances. Where is your center of gravity? And why? How does this level serve you? How does this level limit you? Where do you go under pressure? Where do you need to be in to go to the next level in your life as a horse trainer? From this awareness, you can challenge yourself to grow and to get into an empowering state, all the time, no matter what! This way, you can become the best horse trainer you can be!